simplex noise has a lower computational complexity and requires fewer multiplications. Simplex noise scales to higher dimensions (4D, 5D and up) with much less computational cost, the complexity is for dimensions instead of the of classic noise. Simplex noise has no noticeable directional artifacts. Simplex noise has a well-defined and continuous gradient everywhere that can be computed quite cheaply. For a detailed explanation about simplex noise, here is a nice PDF: Simplex noise demystified. 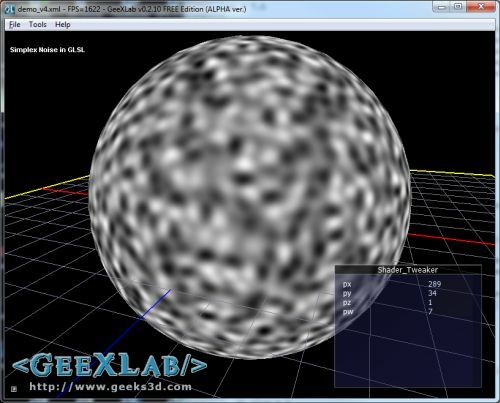 Here is a thread on OpenGL forum about this topic. Just start GeeXLab and load (or drag and drop) the DEMO.xml file in GeeXLab. That’s all! You can find other shaders here: Shader Library. // N points around a unit circle. // Keeping this clean - let the compiler optimize. // Force existance of strict total ordering in sort. This is cool stuff. Finally noise() in GLSL that is fast and decent! This code has been taken from https://github.com/ashima/webgl-noise in violation of the MIT Expat license. Please see https://github.com/ashima/webgl-noise for the latest Perlin and simplex noise shaders with performance improvements and bug fixes.